All 30-year-olds inner-teen just came out this morning, as the Backstreet Boys took to the stage on Good Morning America and performed as a full group for the first time in six years. Kevin Richardson rejoined the Backstreet Boys earlier this year and this is the first time all five guys hit the stage together! The Backstreet Boys made a huge announcement as well: get ready for the BSB Cruise! The Backstreet Boys: Kevin Richardson, Nick Carter, Brian Littrell, A.J. McLean and Howie Dorough performed some of their greatest hits this morning on their Backstreet Boys Good Morning America reunion, including “Everybody (Backstreet’s Back),” “Larger Than Life” and “I Want It That Way.” You can check the guys performing “I Want It That Way” at the end of this article…it makes me feel so old! At the end of their performance, the Backstreet Boys shouted out, “See you next year on tour…brand new record.” So, who out there would be excited for a new Backstreet Boy album? 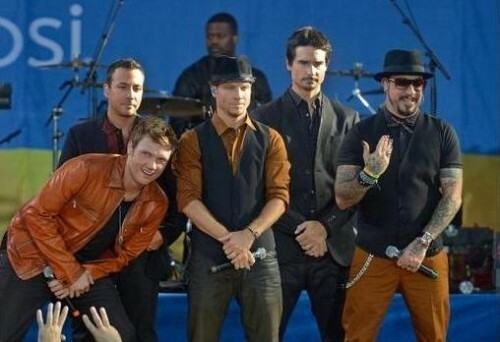 Also during their GMA appearance, the Backstreet Boys announced a BSB Cruise. McLean said, ”Next year, just so you guys know, there will be a BSB cruise next year, in October, with all five.” The band confirmed it on Twitter later in the morning. Are you going to buy the new Backstreet Boys album? Will you be on the BSB Cruise?? ?